Not into reading? No problem, view the video. BAP is ready to work anywhere for you, in a pay-as-you-use model BAP is designed using an agile, open source architecture. 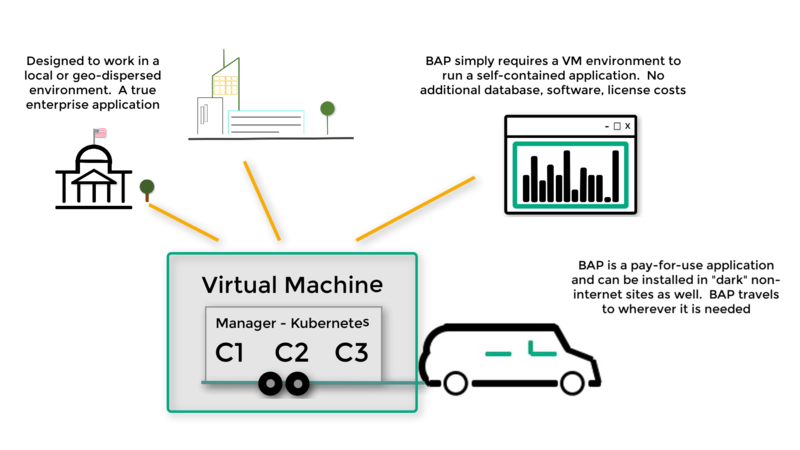 Currently, BAP is offered as a virtual machine for VMWare, Microsoft, and Citrix. BAP also will provide a Docker/Kubernetes and Cloud versions in 2017. BAP is constructed using slots within a framework, what is called the bapFramework. The bapFramework is essentially a collection of multiple Docker containers, managed by Kubernetes encapsulated within a virtual machine. BAP is licensed per slot that you are using within a security policy, although allows for the use of "many policies to use the same cybersecurity standard slot", hence saving you money as you become more secure. BAP is designed to work anywhere you need it. The installation only requires a virtual machine host (it works on ESXi (free version of VMWare)) as well and takes less than 10 minutes to install. Once installed, you simply access the application via a web browser. In addition, BAP import, export and patching functions all support "disconnected / dark sites". Run BAP anywhere, connect via the network or removable media and begin to secure your environments with BAP accountability.